Brigade Nord Africaine was a group of 180 Algerian volunteers established under German supervision. Founded by Mohamed Al Maadi, a virulent anti-Semite who went by the nickname “SS Mohamed”, originally the unit used as guards in the Peugeot factories of Socheaux, Consisted of Vichy followers, ex-POWs, pimps, and criminals, they were known as brutal thugs. At least they were executed 50 French workers and are responsible for many rapes and plundering. But theirs military capabilities were so poor. Thus, when the unit was deployed to fight the partisans of the Dordogne region of France, they almost destroyed. 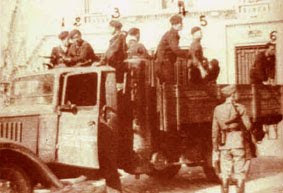 After the Allied landed in southern France, the remaining members of this Arab unit run away to Marseille, where they were hide among Maghreb community in the area or return to Algeria, where they continuing theirs criminal activities, the only of theirs expertise during theirs short existence.